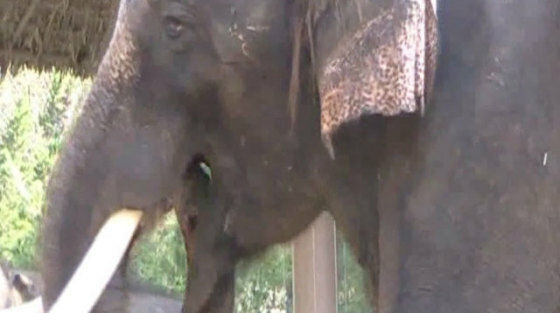 Koshik is not the only elephant who can mimic sounds, but he's the first elephant on record who has developed a way to actually mimic the pronunciation of words spoken by his human trainers. Confirmed by researchers from the University of Vienna, after studying the Asian elephant's pronouncements at his zoo habitat in South Korea, Koshik's exceptional efforts to mimic humans is recorded online now in the journal Current Biology. Most elephants and, indeed, other mammals that are said to mimic human speech, do so by modulating the tone of their voices, specifically the adjustment of muscles that change the size and shape of their resonating cavities, much as if you would change your tone from a tenor register to a falsetto. But to mimic words, you need more than a vocal sound, you need articulation - a way that humans adjust sounds primarily by making contact with two parts of their mouths. This makes the difference between the sound 'oo' and the word 'boot;' for example. What makes Koshik so unique is that he attempted to make the 'consonants' that would affect the sounds into words. To attempt articulation Koshik places his trunk into his mouth, making contact between parts of his trunk and parts of his mouth. He forms words that way, like the word "annyong," which means 'hello' in Korean. He also mimics the words "anja" ('sit down'), "aniya" ('no'), "nuo" ('lie down') and "choah" ('good'), all words he picked up from his trainers. Native Korean speakers were asked to identify the utterances of Koshik, and they recognized almost all of the words, with some confusion on the consonant sounds, which they might have pronounced that way if they had imbibed maybe one too many spiked ciders. Researchers suggest that Koshik's mimicking is an attempt to identify closer with the humans who care for him. As with seals, dolphins, birds, and other animals that imitate not only human communication but communication of other species of animal, this cross-species communication shows the desire to cement cross-species bonding. We've All Heard of Dr. Pepper. Meet Mr. Pepper -- The Crazy Animal Video of the Day!!! Oh, the Joys of a Rubber Snake -- The "Prank" Animal Video of the Day!! !